Our company was founded by Robert Brosamer (shown above with grandaughters Reagan and Natalie), who turned a hobby into a business. After returning from the war in Vietnam, Robert went back to his old job at Fisher Body, got married and bought a house. Since he and his wife couldn't decide on how to decorate it, they started going to auctions in the area and bought antiques to furnish the house. They figured that antique furniture would be easier to resell once they had decided on what new furniture to buy. But before long they were hooked on antiques, and collecting, and BELLS were Robert's favorite. He decided to collect one of every category, always upgrading to the best of each, selling the lesser to pay for the better. The large bells interested him the most, but no one knew (or wouldn't tell him) what they were worth, and he couldn't find any books of any significant help on the subject. Even people who knew of and sold new bells wouldn't say what the new ones sold for, and whether antique bells were worth more or less than new ones. To find out took lots of time, phone calls, hours of idle conversation and brain picking. Robert spent hours reading anything on bells, and doing more talking. He focused on the bronze bells, since they had some value in the metal. He was thinking back to his youth when silver coins could be found, figuring that in a fine bell there was a face value, not just a trend value such as a "Beanie Baby". The collection was growing and the direction was still towards large bells - the sleigh bells and other horse bells just weren't as neat as the large swinging ones. 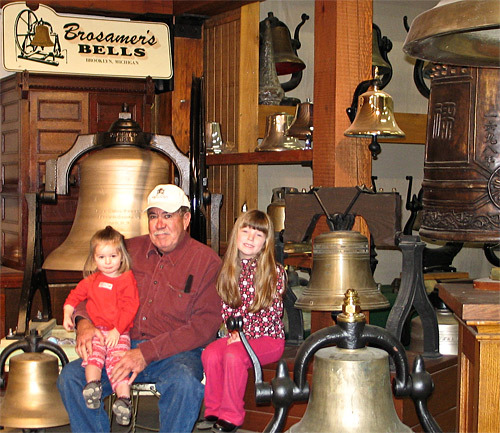 Soon it was time to share his love of bells with others, since the collection was now reaching over 40,000 pounds of bronze, and the wife was hating the B word by now. He ran an ad in an antiques paper and sold his first bell to an Indiana collector, and so the business was born. He has now bought and sold bells in every state, and all over the world. Has met the most interesting people, rich and poor. All sharing the same interest in bells, and for that moment, all are equal. As Robert says, "It's a happy business". When he finds a bell he is happy, when it is restored and looking good, he is happy, and when someone comes along who needs a bell but cannot afford a new one, they are happy. Then when Robert makes the sale he is happy again. And he just bought back the first bell he sold to the people in Indiana, and is keeping it in memory of the deceased friend who sold it to him originally. People would ask Robert, "You do what? Buy and sell bells?" Then when they were done laughing, would ask, "Who buys bells?" He thought for awhile that maybe he was just lucky, selling the ones that he sold, but he says, "After awhile you set a pattern", and it wasn't luck. 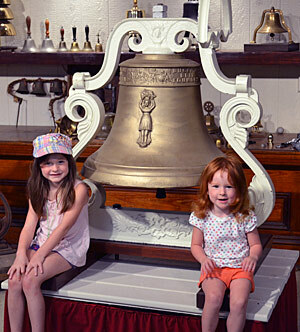 There is a demand for bells, a very small demand. Since there is a demand for small inexpensive bells, we now carry these, and they are usually in stock. 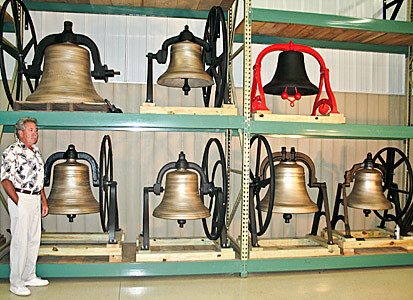 Small hand bells, brass salesroom bells, tip bells, bar room bells, Cast iron post and beam mounted bells, cupola bells large and small. Fire truck bells old and new, railroad steam and diesel locomotive bells old and new, gongs of all sizes, large Buddha temple bells. Along with vintage fire, railroad, and ships bells. Our main business is USED CHURCH BELLS. And we like for you to check out the people who sell the new ones first, get their BEST price, THEN CALL US. Our pre-owned bell prices are unbeatable. We also BUY bells, so if you or your church has bells that are no longer needed, we would be interested in purchasing them. And we will refurbish and find a new home for them to be rung and enjoyed again. We deal in REAL BELLS. All of our bells are manually operated by ropes and pulleys, etc. If you do want your bell rung electrically, we send them out for this. We work with other companies and can put you in touch with them. We are in the Eastern Time Zone; best time to call is 10 am to 4 pm. Entire Site © 1999 - 2019, Brosamer's Bells, Inc.